Artisanal brewing is a complex, time-consuming process with numerous opportunities for the brewer to influence and perfect the flavors, aromas and concentration of the finished product. The heart of the brewing process is a complex two-stage fermentation in which the carbohydrates, proteins and fats in the soybeans and wheat are broken down and reconstituted into new compounds. Japanese soy sauce is made from by fermentation using four simple ingredients: wheat, soybeans, water and salt. The soybeans and wheat are combined with a mold (Aspergillus sojae) to produce “koji.” When the koji is fully fermented, it is combined with salt, water, yeast and lactic acid bacteria to produce a “moromi” mash. The moromi is fermented as long as three years. 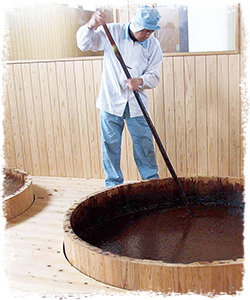 After the moromi is fermented, it is pressed, filtered and heated to produce finished soy sauce. Variations in the ratios of ingredients, methods, time and strains of micro-organisms create an enormous variety of flavors and quality. Making koji out of soybeans, wheat and mold is the first step in creating soy sauce. The brewer begins this process by selecting the wheat and soybeans. A wide variety of soybeans are used in soy sauce production. Since WWII, the vast majority of soy sauce has been made with defatted, broken soybeans. 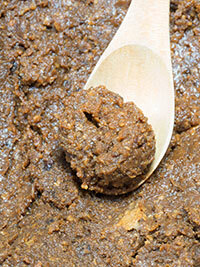 This defatted soy meal is less expensive and ferments much more quickly than whole soybeans. Higher quality products such as Shiso Marudai are made from whole soybeans, which look similar to edamame beans. These whole soybeans, with increased oil and longer fermentation time, lead to a smoother, softer and more complex flavor. This longer fermentation also increases the amount of glutamic acid, the primary component of umami flavor and mouth feel. 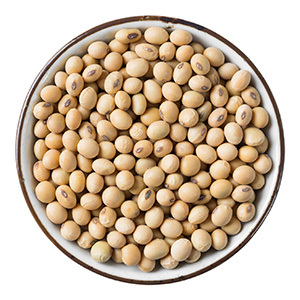 The soybeans (or soy meal) are first soaked in water, and then boiled or cooked in a large pressure cooker. The length of cooking time, as well as the temperature and pressure, are determined by the brewer to optimize the finished product. The wheat is roasted and cracked. 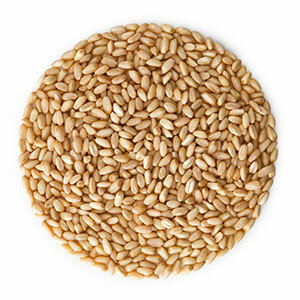 The degree of roasting and size of the cracked wheat have important effects on the finished taste of the soy sauce as well. A few of the most traditional breweries still crack the wheat by turning it in a large metal drum with smooth river rocks. The soy beans and wheat are them combined in various proportions while still warm. The ratios vary depending on the style of soy sauce and recipe. This mixture is then combined with specific strains mold, Aspergillus oryzae or Aspergillus soyae, which is called “tane-koji” (koji starter). The resulting dry mash is called koji.Various strains of aspergillus are used throughout the word in natural food production. The soybeans and wheat are then combined in various proportions while still warm. The ratios vary depending on the style of soy sauce and recipe. This mixture is then combined with specific strains mold, generally Aspergillus soyae and, occasionally Aspergillus oryzae , which is called “tane-koji” (koji starter). The resulting dry mash is called koji. Various strains of aspergillus are used throughout the world in natural food production. This koji mash is carefully fermented for two to three days under highly controlled conditions in a special room at the brewery. Knowledge of the perfect amount of time, temperature and humidity for this process is a key component of a brewer’s skill. Traditional breweries often have a raised wooden floor in the koji fermentation room to allow for air circulation, as well as adjustable air vents, a heater and a water boiler to control the temperature and humidity. In smaller breweries, the brew master will often stay near the koji mash to constantly monitor its progress. The aspergillus grows on the koji very quickly and releases a fair amount of heat. If the temperature in the koji becomes too high, the aspergillus will die; too low and the product becomes unbalanced. This stage of the brewing process is very delicate and mistakes can lead to the loss of the entire batch koji. The brew master will use the heater, vents and hot water to optimize the environment for this process, which also includes mixing and moving the koji with a long handled wooden rake to ensure the aspergillus growth is even. During this dry fermentation, the koji mash becomes lighter and looks as if it is covered with a fine layer of white powder. The aspergillus mold contains enzymes that perform two essential functions in the fermentation process. These enzymes break the starches and proteins in the wheat into simple sugars, peptides and amino acids; and breakdown the proteins and fats in the soybeans into simpler lipids and amino acids. These simpler molecules are then used as the basis for the second stage of the fermentation. The koji fermentation also produces glutamic acid, which is the amino acid that creates the “umami” flavor. Umami has been called the fifth flavor, along with salty, sweet, sour and bitter. The umami gives soy sauce its unique rich flavor and mouth feel, and intensifies the meaty, savory flavor of other foods as well. Glutamic acid is one of the most abundant naturally occurring non-essential amino acids. Glutamic acid is found in tomatoes, Parmesan cheese, potatoes, mushrooms, and other vegetables and fruits. MSG, a form of glutamic acid, is used in the food industry as a flavor enhancer. A common misconception is that MSG can cause headaches and other feelings of discomfort, but in controlled studies, scientists have been unable to trigger such reactions. The U.S. Food and Drug Administration has given MSG its generally recognized as safe (GRAS) designation. When the brewer has determined that the koji fermentation is complete, the koji mash is combined with water and salt to make a mixture called “moromi”. The source of the water, as well as the type of salt, effect the flavor as well. The salt content of the mixture varies depending on the style of the soy sauce and the brewer’s formula. The moromi is made in large wooden vats, some of which are more than a hundred years old, for a secondary fermentation. Many older breweries were built on or near fresh water springs known for the purity of their water. Higher quality soy sauces also use sea salt, which is collected from evaporation ponds near the ocean. After mixing with the salt and water, the Aspergillus mold on the soy and wheat releases enzymes which break down the grain and soy proteins into free amino acid and protein fragments, including glutamic acid. The starches in the wheat and soybeans are converted into simple sugars. A small amount of a live “mother culture” is added to the moromi to start the secondary fermentation. Each brewery maintains a mother culture, which is a living mixture that contains the strains of yeast and lactic acid bacteria (LAB) which are unique to the brewery. The yeast used in the soy sauce fermentation is similar to the yeast used in beer and wine fermentation. The LAB are related to the strains of bacteria used to make cheeses and a large variety of other food products. These mother cultures are often centuries old and have been developed through painstaking cultivation at the brewery over hundreds of years. Wineries, breweries, bakeries, and cheese makers throughout the word maintain a unique mother cultures to propagate their fermentation process as well. A tragic consequence of the consolidation of the soy sauce industry in Japan is the loss of these unique mother cultures each time a traditional brewery closes. The moromi mash containing the live mother culture is then stirred and aerated for a period from six months to three years in a controlled environment that is reminiscent of a wine or cheese aging cave. These aging facilities are usually large, barn-like structures that have the distinct smell of the native yeast. The aging moromi slowly transforms into a semi-liquid, reddish-brown “mature mash.” The amount of time the moromi mash is left in the barrels, the frequency of stirring, and the aeration are all carefully controlled by the brew master and have important effects on the finished product. The yeast and LAB contained in the mother culture grow in the moromi mash and cause a second fermentation. It is this secondary fermentation process that creates the many distinct flavor and fragrance compounds that build the soy sauce flavor profile. During this fermentation the ingredients gradually decompose into organic acids, amino acids and alcohols, the combination of which gives the sauce its distinct character. These acids also lower the pH to about 4.6 – 5.2, which gives soy sauce it’s acidic flavor, and a range of 16 – 18 percent salt solution. This fermentation process also creates more than 300 different flavor compounds. Lactic acid bacteria convert some of the sugars into a variety of organic acids, including glutamic and aspartic acid, lysine, alanine, glycine, and tryptophan. The lactic acid and other metabolic products contribute to the smell, taste, and textural profile of the soy sauce. The yeast converts the simple sugars from the wheat into small amounts of alcohol, carbon dioxide and other elements which enhance the aroma of the soy sauce. Ethyl alcohol is the most common of these alcohols, and it imparts both flavor and odor. Acids are generated from the alcohols and sugars, which round out the flavor and provide tartness. Finally, aromatic esters (chemicals that contribute flavor and aroma) are formed when ethanol combines with organic acids. Different sugars are also derived from the vegetable starche by action of the moromi enzymes. These sugars help subdue the saltiness of the finished product. The finished mash is very thick and looks similar to refried beans. It has a pungent, yeast aroma that pervades soy sauce breweries. When the brewer determines that moromi fermentation is complete, the raw soy sauce is separated from the solids by pressing the moromi through layers of filtration cloth. Traditional brewers use an elaborate system of folded cloth, often using bolts hundreds of yards long. The Moromi is deposited on to these long pieces of cloth, which are folded over to create a stack of alternating cloth and moromi mash. 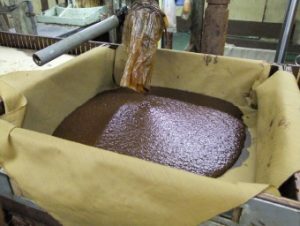 The layered cloth and moromi are then pressed to release the soy sauce, which is known as “nama-shoyu,” which is “raw” soy sauce. The nama shoyu is then heated to form additional aromatic and flavor compounds and to stop any additional fermentation. After the heating process, the soy sauce is bottled and ready for consumption.